We are the World Champs! Members of the victorious West Indies U19 team shortly after their arrival in Barbados. Bangladesh after being crowned champions of the ICC U19 World Cup on Sunday, when they beat India in the final by five wickets with three balls to spare at the Sher-e-Bangla Stadium. They were hosted to two special welcome ceremonies in Barbados on Tuesday. In attendance were Richard Sealy, Acting Prime Minister of Barbados; Stephen Lashley, Minister of Sports in Barbados; Michael Muirhed, CEO of West Indies Cricket Board; Joel Garner, West Indies legend and President of the Barbados Cricket Association; Desmond Haynes, West Indies legend and Chairman of Cricket Legends of Barbados; David Deane, CEO of Barbados Cricket Association; and Connor Looney, CEO of Digicel Barbados – Digicel is the the official team sponsor. 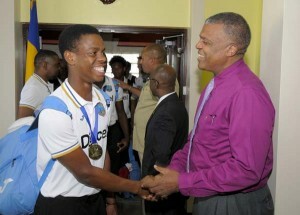 CEO of WICB Michael Muirhead greets captain Shimron Hetmyer.